Mix the olive oil, garlic, salt and pepper together in a small bowl and set aside. Stand the bell pepper up vertically and slice from the stem end downwards. Cut off a quarter of the bell pepper, each time, leaving the stem and seeds to discard. Cut the zucchini in half, lengthwise, and then slice the halves again vertically so that you have 4 slices of zucchini each about ¼ inch thick. Slice the onion into four slices horizontally as cutting for onion rings. Place vegetables in small roasting pan and spread out so that they distributed in one layer, and then drizzle them with the olive oil mixture. Toss vegetables so that they are well coated with the oil. Transfer to the oven and roast for 20 minutes. Using a fork, turn the vegetables and continue roasting for 10 to 15 minutes longer, until the vegetables are golden brown. Remove the pan from the oven and allow the vegetables to cool to temperature that is easy to handle. Using a sharp knife cut the bell pepper and zucchini into strips ¼" wide. Separate the onion into rings. Set aside. Cut the baguette at a diagonal angle into 1/3" wide slices. Sparingly coat both sides of the bread with olive oil using a pastry brush and place on a baking sheet. Place 3" below broiler. Lightly toast the bread on both sides. (Alternatively, place the slices of bread in a panini grill and cook until the bread is pressed flat and toasted on both sides.) Remove the toasts from the broiler and rub each toast lightly on one side with a whole garlic clove. Turn the oven to 350F. Return to the toasts to the baking sheet. Top each piece of toast with slices of mozzarella to cover the surface of the bread. Arrange the strips of vegetables in a pattern, with the zucchini at one end of the slice of bread, the red bell pepper in the center, and the onion at the other end. Transfer the crostini to the oven and bake for a very brief period, less than 5 minutes, until the mozzarella just begins to soften and melt. 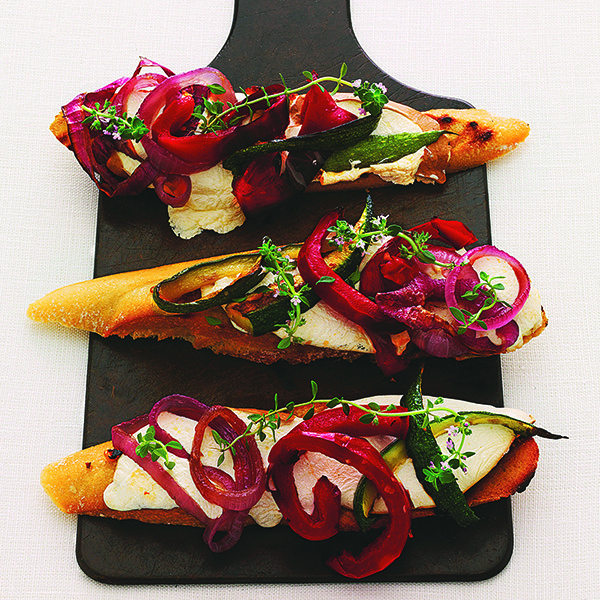 Remove the crostini from the oven and sprinkle with fresh thyme and pepper. Place on a serving platter and garnish with fresh thyme sprigs. Serve immediately while still warm.